It feels like it's been a very long month - it has. The Harry Potter concert (if you were fortunate enough to go) was the culmination of a very busy month for me musically in October. But just how long was it - 31 days? No, for me it goes back to July - and maybe even back to last April for the Botti concert. Anyway, I feel like November 2011 might just give me a bit more time for reflection. For a couple months now I'm hopeful I can hunker down on what I'll just call "Project Blue" - a collection of new songs for sometime in 2012. 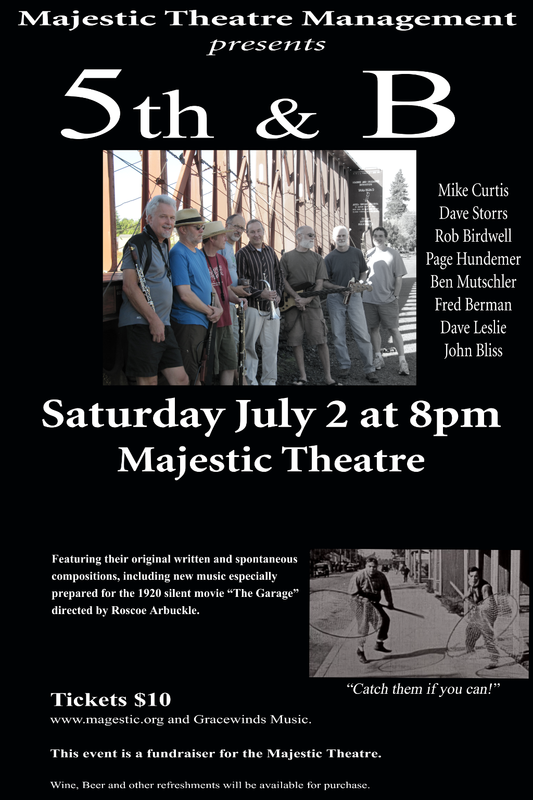 July 2 - 5th and B played a fundraiser for the Majestic Theatre (the term "fundraiser" will come up often here) - love the causes, but boy is it tough sometimes. Not this gig though - a chance to play on the Majestic stage for a full house with some of the best players around. It was cool. And we created a score for the Roscoe Arbuckle movie "The Garage" - the show was not without a hitch or two (our auspicious start still haunts certain players) but it was grand. July 4 - Backup horn work with Caught in the Act for the Red, White and Blues fest in Corvallis. A great band and a lot of fun. July 9 - The Svens played Bombs Away. Playing sax? What am I, nuts? Guess so. Oh, I played my Trumpet/Flugel too. Sang a couple I think. I'm pretty sure I messed up the lyrics but no one has ever called me on this so I don't usually bring it up. July - creating an online Jazz History course for OSU e-campus. Teaching an online course - really? I'm in over my head but fortunately I've got great material. And fortunately it all has to be done by August 4, so I'm almost there! 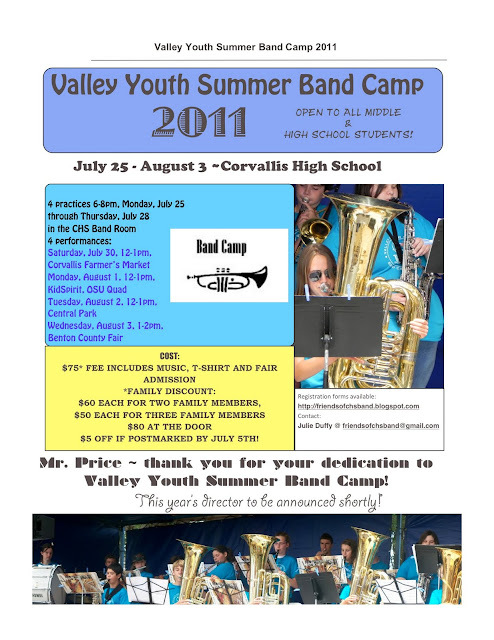 July 25 - August 3: summer band camp! Normally 30 to 40 kids sign up. But since I'm so popular in this field, well 14 kids actually signed up. No worries though. This band was awesome and the kids did a great job. 4 rehearsals, 4 gigs...very fun! Around this time meetings begin about the spring 2012 pops concert...and then meetings start about the Harry Potter concert. It all seemed so distant at the time - but the planning goes on...a real treat to work with Marlan, Ken, Erin, Tina and the many others involved. August 18 - 20: helped out with an OSU Jazz Camp lead by Dr. Dana Reason. What a great time and all great people involved...I'm being lazy by not mentioning all their names, but they know who they are! This event culminated with a short concert by the students in Benton Hall (which was amazing!) and then a concert at LaSells featuring Billy Childs and Steve Wilson. I had the honor of introducing them - now how cool is that? And if I was long-winded, well sue me. These are some of the best musicians on the planet so I simply said what I thought needed saying. It was sort of funny because I peaked in to their dressing room where Billy and Steve were just chatting like old chums (and of course they are great friends!) and mentioned that I was introducing them. I asked them if there was anything I should or shouldn't say - Billy got all serious and said: "Yea, Rob please say this: Billy Childs is....the....(and I'm starting to take notes) ...the greatest...piano player ever..." - hey, I wasn't going to argue. Steve wanted to check my notes and I said sure - he's amazed that so many people mess up his bio...but I'm a fan so that wasn't the case here. My head is still spinning with the things they played. August 27 - a Svens Beach party at at Starker Arts Park. 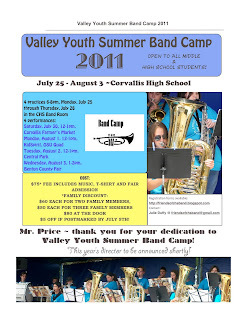 For the history books though, I'll just call this "Summer Jam 2011" - a mini festival of folk music and then The Svens. It's such a beautiful park and nice to play - maybe next year we'll get the attendance up a bit. On September 15th I sat in with the Creighton Lindsay Band at Cloud 9. What a nice time that was. Looking forward to more interactions - great players playing great music! On September 17th The Svens played the Corvallis Brewfest at the Benton County Fair Grounds - holy smokes, was that event packed. It seems that people really like beer and music- go figure! Anyway, that was nice - playing under a tent like that. And I sat in with the Plaehn-Hino group too - strikingly similar to the Creighton Lindsay band, but no, a completely different ensemble! That was fun and just seemed like icing on the cake to sit in again. Besides, it would mark the start of my Tom Waits listening bender, that still persists today and probably for some time to come. At some point in here in late September I did something else pretty cool - I played on a "real" album! (Or at least what will be a real album in 2012.) Halie Loren and Matt contacted me - they were literally finishing up and mixing their recordings for an early October mastering session and thought some trumpet and/or flugelhorn might work. Never one to say no, I said a jubilant "yes" - it was a fantastic experience. They were so nice and professional. I played on three tracks and yes, I got a second crack at "Sway" - it's going to be a great record for them I'm sure! September 26 - my online course at OSU begins. And on a personal note (like none of this is personal) I pay $5 to get my dog into the Dog Day at Osborn - we're there 5 minutes. My dog hates the water...I knew that but just needed to be sure. 5th and B rehearses here and I bring in a new tune, Väsen Dance - a relentless stream-of-notes-in-your-face-horn-line-thing in a triplet feel that tries to emulate the great folk band "Väsen" who I heard when they were in Corvallis. 5th and B play a show at Sunnside Up on October 9. One of the hightlights of my musical life is playing with Dave Storrs, Fred Berman, Ben Mutschler, Mike Curtis, John Bliss, Dave Leslie, and Page Hundemer. I can't imagine it gets any better than that. On October 12 I get the honor of guest conducting two selections with the Corvallis-OSU Symphony: the first was my own arrangement of the Spanish folk song, "De Colores" - I dedicated it to the memory of Corvallis resident and composer Tim Misner. There was a children's marimba group out in front and nearly 1000 5th graders singing along. It was quite a sound - and at the end I conducted "Harry's Wondrous World" as a sneak preview for the Potter concert. And a good thing too - getting to rehearse that piece went a long way as it sort of got us into the "Williams" mode. I don't believe there was any recorded documentation of this event which is too bad - it's not often I get to conduct an orchestra and 1000 kids singing - but unless I'm dreaming, it really happened and I recall it as being really, really fun! On October 21 "Sideways Portal" re-united to perform a tone poem for the Magic Barrel event. This year's event would bring in more donations than any other year. I think our performance really gelled. Despite all the different things we all do and the amount of time we do or don't get to play together, there's been enough "sweat equity" invested that we can actually just go out, find that gear and drive down the road. And what a drive it is playing with Dave, John, & Page. Never better on this one. Although Dave had a cold and was probably feeling awful - that didn't affect his musical spirit though - not one beat. The next night, October 22, I'm back with The Svens at Bombs to play my part in the great story by Viking: "Wade H. Dean - Businessman" - always very rich to play with Sticky, BasSven and Viking. I'd miss their October 28 show since I had a rehearsal that night with the Symphony - I don't have any problem shifting gears from symphonic to surf...but it was not to be on that particular night. 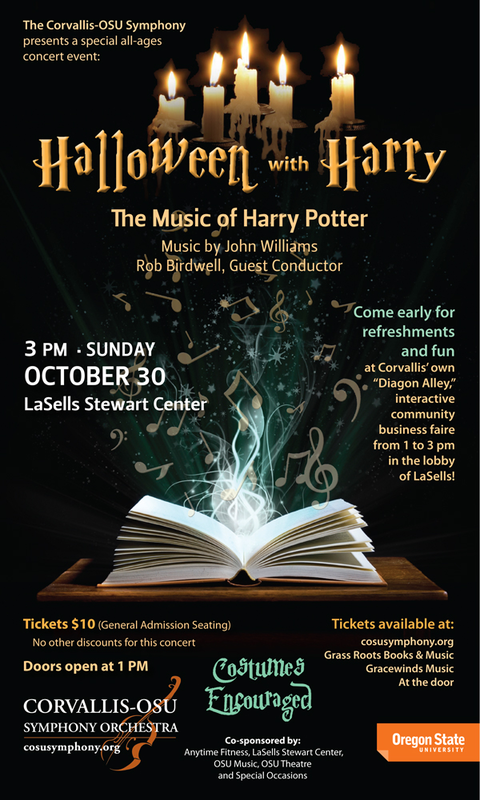 Besides, at that point I was focused on pretty much one thing: The Harry Potter concert on October 30 wherein I get the honor of guest conducting 8 selections from two different suites by John Williams of the music from Harry Potter. Many nights of score study, planning, and wondering - afterall, this was hard music. A relatively short rehearsal time frame. Not only is the music sensational (I've loved John Williams since the days of Jaws, Raiders, Superman, Star Wars and everything since) but being able to witness what the team put together for the Diagon Alley lobby was absolutely amazing. It was an amazing concert. As I look ahead there will undoubtedly be more gigs, concerts, shows, one-shots, recordings and collaborations. But this period of time feels sort of like my "long month" - certainly not lazy. If I could spend most of November in my PJs and slippers just practicing every day, writing and producing little bon-bon tunes, I would. But there's really no chance of that so I'll have to forge on the wee small hours. And there's an even bigger chance that my long month is only beginning.